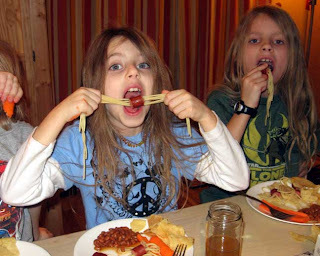 Or as the kids have been calling them, squid dogs (on the count of they look like squid)! Sounds gross but it is a really cool twist to the traditional hot dog (and spaghetti for that matter). I saw them in the latest issue of Family Fun Magazine and after having a stomach bug last week (always fun right?) I figured we were due for something special. 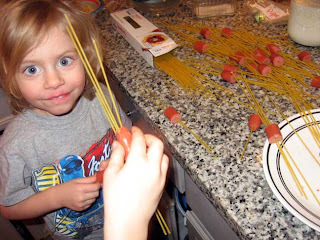 They are super easy to make (takes a bit longer than regular hot dogs or spaghetti) and the kids LOVE them!! 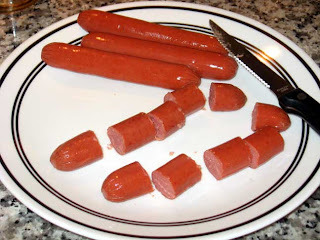 All you have to do is . . . .
Cut your hot dogs into pieces. I did 5 pieces per dog but you could do more or less. 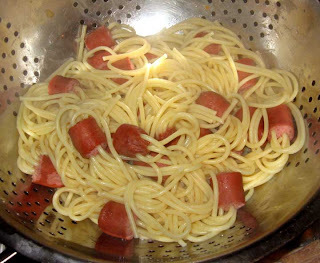 Insert uncooked spaghetti into the hot dog pieces. The kids had fun with this which definitely saved me time (I was shoving like 3 in at a time to go quicker). 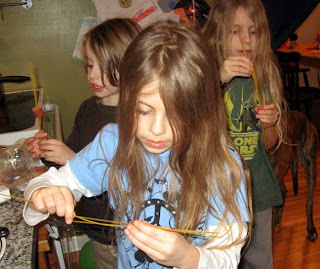 We did like 5-7 strands of spaghetti per piece. You could do less. I guess it depends on how much pasta you want. 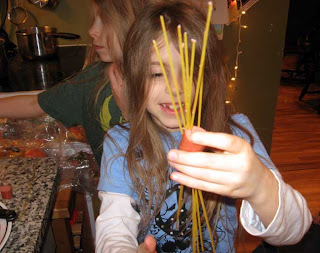 It ended up being quite a load of spaghetti. 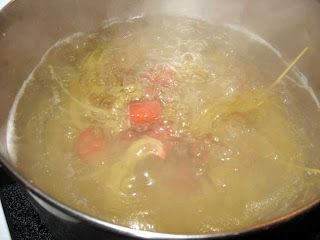 Then boil. I just boiled according to the spaghetti instructions. As you see the kids had fun eating this! 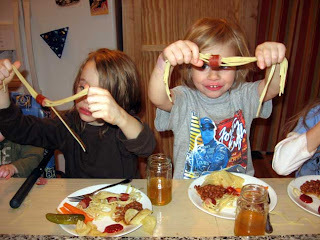 We just ate them like we would regular hot dogs, they had ketchup to dip them in. 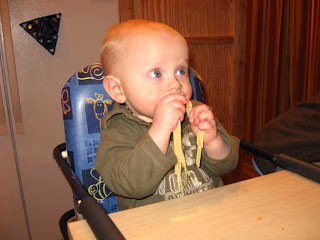 But you could totally serve it like spaghetti (especially if you use a lot of spaghetti like we did) and do it in a bowl with pasta sauce (assuming you can keep their fingers out of it, LOL). We don't do hot dogs often, but this will definitely be the way we do them from now on!! 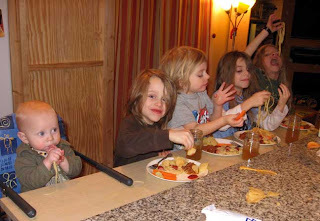 funny, i saw this in the mag and almost tore out the page to put in to try pile...looks like all enjoyed! Kelley, I won't tell Thrace you called him Ever....LOL. Love ya! LOL Kellianne, he is used to it, I do it ALL the time. Funny thing is I remember typing Ever, but then went back to fix it and couldn't find where I had done it, LOL!! But that was probably because it was 4am. I want to know more about the Tibicos!